Clean, Healthy, Natural, Whole Grain and the list goes on. These words are all the buzz in the industry and Burry Foods is happy to announce that select Burry Bagels are now CLEAN LABEL. Our clean standard aligns with the standard Whole Foods® has defined on their website. Most importantly to note is the select Burry Bagels contain NO: High Fructose Corn Syrup (HFCS), ADA, Cal-pro, Artificial Colors or Flavors. 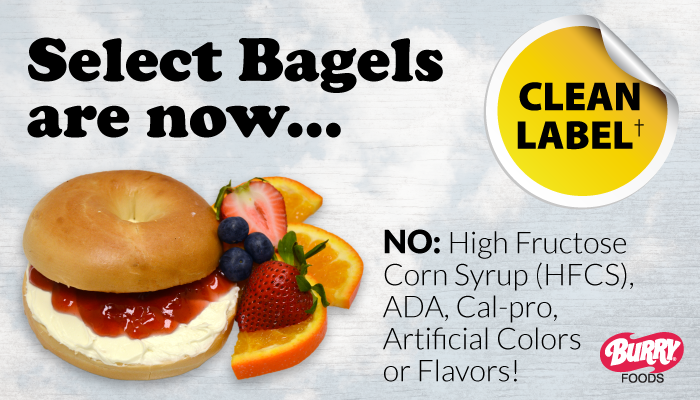 A complete listing of clean label bagels can be found here. We at Burry Foods strive to bring our customers quality products. If you have any questions, please feel free to contact the Burry marketing department at marketing@burryfoods.com.